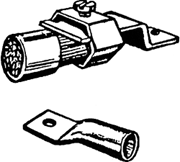 A projection or head on a metal part to serve as a cap, handle, support, or fitting connection. 1. In electric wiring, a device for terminating a wire or cable; the lug is bolted to an electric terminal. 2. A small projection attached to any member or component for use in handling, assembling, or installing. (1) (Linux Users Group) A formal or informal organization of Linux users who gather together virtually or in person to exchange information and resources. Some groups maintain mailing lists and send out newsletters for their members. For more information and a list of international user links, visit www.linux.org/groups. (2) (Logic Users Group) A large and well established online community that maintains Web forums and resources for Apple's Logic Pro MIDI sequencer and other related audio hardware and software from Apple. For more information, visit www.logic-users.org and www.apple.com/logicpro.